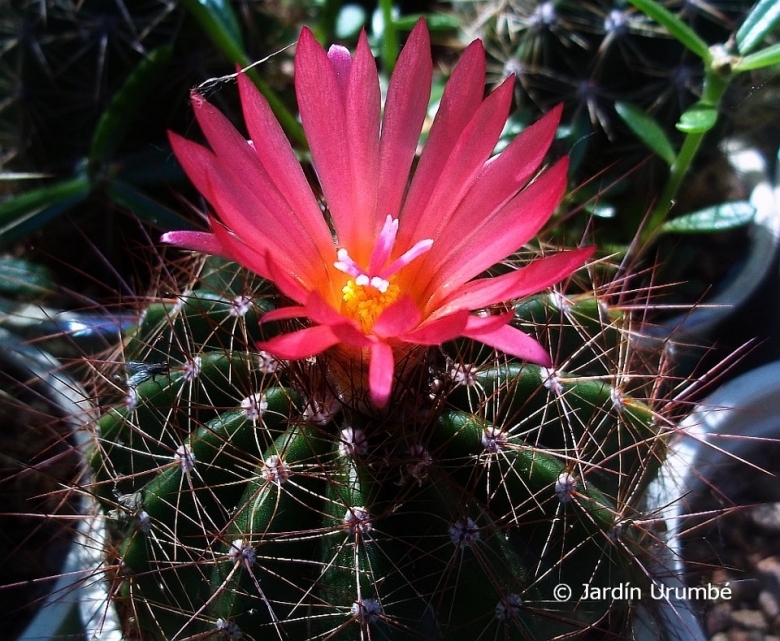 Origin and Habitat: Rio Grande do Sul, southern part of the the range of Notocactus horstii (Santa Maria, Cerro Botucaraí, Candelaria, Sao Pedro do Sul, Sao Martinho) Brazil. Type locality: Sao Martinho and Santa Maria, Serra Geral, Rio Grande do Sul, Brazil. Altitude range: Around 150-350 metres above sea level. 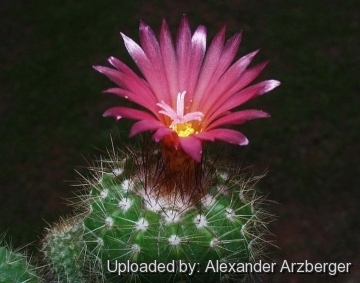 Description: As the name implies Notocactus horstii f. purpureus is a distinct purple blooming form. However the plant occurs in several places, and is quite variable both in habitat and in our collections too. The spines range from nearly white to red-brown, and flowers from light-pink to dark purple. Stem: Grass green, up to 14 cm in diameter, solitary (non-offsetting). Central spines: 4-6, reddish brown, somewhat bent, up to 20 mm long. Flower: Up to 4 cm wide. Inner perianth segments purple, 18 mm long and 4-5 mm wide. Nectar chamber narrow. Stamens inserted along the whole length of the tube. Style pink, stigma-lobes 10, spreading, almost white, 7-8 mm long.